A Hall of Famer, At Last | American McCarver. Your Sports Blog. 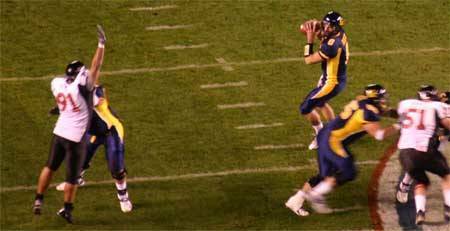 Anyway, a few years ago I realized that no Cal football players have ever been inducted into the Pro Football Hall of Fame, either. Now, there’s decent news on the horizon: former Cal Bear Tony Gonzalez has turned into one of the best Tight Ends in NFL history. So he seems to be a lock. Then there’s Aaron Rodgers, who departed Cal after the Holiday Bowl letdown (see photo above) for the green room of the NFL Draft. After sitting in the green room for approximately five years, a Green Bay-bound tomato truck passed by and offered the down-on-his-luck kid a lift. After holding a clipboard for approximately five years while Brett Farve dithered and re-dithered and zithered and slithered and finally parted ways with the Packers, Rodgers took over and became a star, and finally won a Super Bowl. Now, Trent Dilfer will tell you that winning a Super Bowl is not a ticket to the Hall of Fame for a quarterback. But it sure helps. So perhaps Aaron Rodgers will one day make it there too. In the meantime, though, Cal has found its first football hall of famer, and it comes from an unlikely source: the 1951 Rose Bowl team, the second-to-last such Cal team to win its conference championship outright. Les Richter, a linebacker for Cal who went on to play for the L.A. Rams, was inducted to the Pro Football Hall of Fame this weekend. Richter played nine seasons for the Rams, then retired and got into motor sports, eventually becoming a NASCAR executive. He died in June 2010, but he’s achieved immortality in Canton, Ohio. Given that Cal will never, ever play in the Rose Bowl again, this is about as good as it gets. Unfortunately, we’re still two Hall of Famers behind Stanford.